First of all thank you friends to visit our website, here, I represent all the staff to support our new friends and friends expressed sincere thanks. 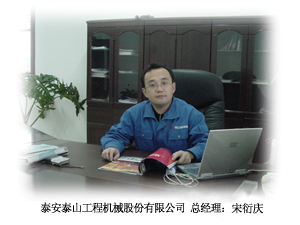 From the initial production of pipe machine to today's multi-series engineering machinery products, from the assembly processing to the design, production, sales and service of the joint-stock companies, the company is a vigorous situation, impressive performance, based on the construction machinery industry. Based on years of professional experience in construction machinery, rigorous production management, and improve after-sales service, and establish a good corporate image. 2006 Taishan Construction Machinery Co., Ltd. forge ahead, pioneering and innovative, and successive development on behalf of the international advanced level DGY-70H, DGY-90 pipe machine. The introduction of new products won the majority of users praise. And further expand the domestic market share, and successfully into India, Pakistan, Russia and other foreign markets. For the company to create a greater room for development. Of course, "survival of the fittest, survival of the fittest" This is the same market economy competition law. We have suffered the difficulties of entrepreneurship, but also cherish today's hard-won achievements. Taishan Construction Machinery Co., Ltd. will continue in the future as always to meet customer needs as their responsibility to "win the ambition, vigorous vitality, pioneering spirit, high morale" to further develop new products and dedication to provide quality users Excellent engineering machinery products, for the development and progress of domestic construction machinery to contribute.